My kids love to give Valentines to their friends, and so do I! 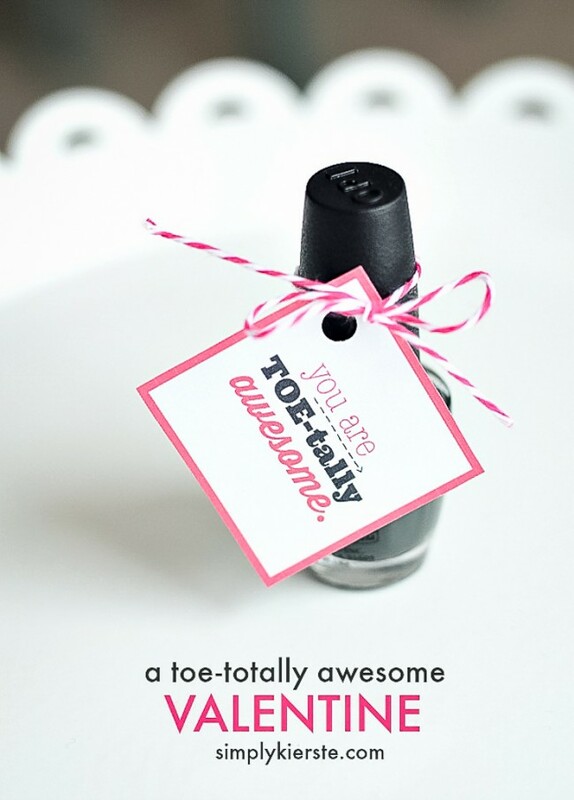 This darling “toe-tally awesome” valentine is perfect for all the girls in your life! So cute, and so easy! Just tie on the tag to your favorite nail polish, and you’re set! They’re perfect for friends, sisters, moms, teachers, hairstylists, and all those ladies in your life that you want to give a little love to. It doesn’t have to be for Valentine’s Day…you can use it anytime you want to give a fun gift. These would also make cute favors for a party, bridal shower, or girls’ night. They’re also perfect valentines for tweens and teens, when they want to give something that’s a little more grown-up. Nail polish really varies in price, so it can also fit a wide budget range. Sign up to get even MORE great ideas…right in your inbox!! Thanks so much for sharing the electrons!! Busy moms appreciate it!!! LOVE LOVE LOVE this!!! Thank you!!! Using for my daughters class party for the girls!!! These are great! My daughter’s drill team is having a Valentine’s party. This idea is perfect! Love, love the printables!! Thank you!